Can Lakers get out of Kobe’s contract if he can’t come back? Kobe Bryant recently signed a two-year, $48.5 million extension with the Lakers. Will the team regret the move? 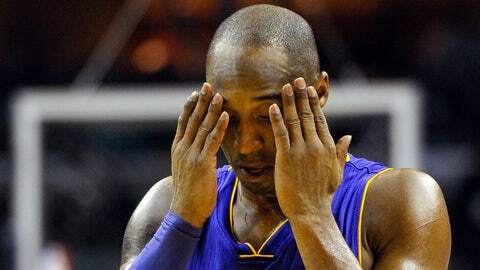 In relation to ligament damage or an Achilles tear, the knee fracture Kobe Bryant suffered Tuesday is a minor injury. He is expected to miss six weeks, which ordinarily would not seem like a devastating injury. Given that Bryant was still shaking off the rust from a severe Achilles injury, that he is 35, that he has played more minutes than all but five players in NBA history and that the Los Angeles Lakers do not appear to be championship contenders, it is fair to wonder whether this might mean the end of Bryant’s career — and what it would mean, financially, for the Los Angeles Lakers. In November, the Lakers offered Bryant a two-year contract extension worth $48.5 million. He, of course, accepted. NBA contracts are guaranteed; under the basic rules of the Collective Bargaining Agreement, Bryant’s salary would count against the Lakers team salary and salary cap figure even if he retired. There is an exception, however, for career-ending injuries. In the extreme event that a doctor (jointly selected by the NBA and the players’ association) judged Bryant’s injury to be career-ending, the Lakers could continue to pay him his salary without it counting against the cap. The Lakers would have to waive Bryant, then wait 60 days to apply for the exception. If, after doctors had declared his injury to be career-ending, Bryant returned to the league long enough to play 25 games, his salary would again count against the Lakers — whether he played for the Lakers or not. Some teams would be able to get around that problem entirely by using the amnesty clause, which gives NBA teams the opportunity to release a player and not have his salary count against the cap. Teams can do this only once under the current CBA, and the Lakers already used their amnesty opportunity on Metta World Peace. That decision could hurt the Lakers twice, as they are committed to injured 39-year-old guard Steve Nash through this season and the next. In other words, outside of hoping they get healthy and an unlikely medical examination, the Lakers don’t appear to have many options.